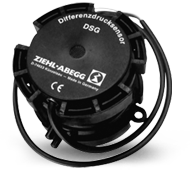 Designed for measuring differential pressure in air ducts, fan inlet nozzles and roof mounted fans. The differential pressure sensor is connected to the ventilation system by two pressure connections and can regulate the air pressure or air volume flow via the control unit. Comes with 0.5m connection cable.